Fine. Some slight shelf wear, otherwise a new and unread book. Very Good. 0747594805 ALL BOOKS SHIPPED WITHIN 1 DAY OF PURCHASE! Neil gaiman is a genius. The imagination. He is so original. I don't care what age group the book was intended. The man is a revelation. He's incapable of writing a bad book. My son loves Neil Gaiman and he is 9 years old...I ordered most of his books. Fun, thoughtful, and sweet read. The main character, Bod, is a boy raised by the kind-hearted ghosts of a graveyard since he was an infant. The main plot of the book loosely revolves around a menacing threat against the main character and the inevitable confrontation, but it doesn't really dwell on it. Although Gaiman does his normally solid job of bridging worlds like they've always existed like this, the best parts of the book are the many soft touches about getting to around 14 years old. The understated themes of the book: finding your place, the transitions and sacrifices (wanted or not) that occur as you move from one phase of your life to the next, living your life, etc. should find a receptive audience among readers of all ages. This book begins with the horrifying murder of an entire family in their home ? or almost the entire family, as a toddler manages to slip away into the night and away from the immediate danger lurking in his home. The reader, like the toddler, is spared witnessing violence. The toddler is rescued by the neighbors, to begin the adventure of a very unconventional life. The neighbors live in a graveyard, and they protect and care for the toddler in only the best fashion that the dead can provide! Adopted by the childless couple, Mr. and Mrs. Owens, the toddler is named Nobody Owens, because he looks like nobody but himself. He became known as Bod, (the shortened version of Nobody), and is given the ?Freedom of the Graveyard?. Also bestowed with the Freedom of the Graveyard is Silas, the resident of the graveyard who is capable of traveling between the graveyard and the rest of the world. Silas accepts responsibility for procuring food for the living child and eventually becomes his tutor. Bod, who knows no other life, discovers a balance between the living and the dead. While Bod attempts to learn history from the graveyard denizens, or perhaps the ghostly art of ?Fading?, the reader learns about the continued threat of the murderer of Bod's family and why Bod's existence continues to threaten the murderer. As this coming of age tale unfolds, we also learn the truth about those plotting against Bod and the mysterious origins of some of Bod's tutors. As supernatural as all of his surroundings appear, Bod is like other boys in that he belongs to a family, discovers love, makes friends, and develops toward adulthood. All these things prepare him for the day when he must leave the graveyard and return to live the life for which he was born. To some analysts concerned with the trend in paranormal juvenile and young adult literature, it is understandable why there would be some apprehension toward recommending this book to young readers, and perhaps this could be the only negative aspect of the book. After all, books concerning murder and violence are universally considered unsuitable for young readers. However, once the true nature of the book is revealed, it should dispel any apprehension of the paranormal, horror, or violence and see that this is really a story of caring, presented in a way that is suitable for young readers. This book engages the reader from the first sentence in which we immediately want to know who holds the murder weapon, and why. The characters are believable in their reactions and emotions although they are wholly imaginary. The graveyard represents a place of safety in which Bod is able to rely when threatened by the murderer or by other unworldly perils. In a place that should be ultimately foreboding, Bod instead learns what it means to live life to the fullest. The writing is excellent and the storyline is compelling. 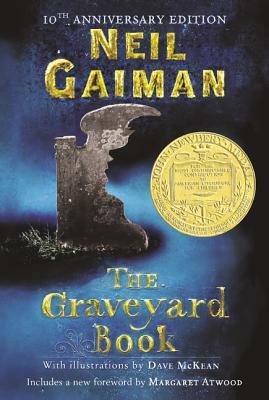 This book was selected to receive the 2008 Newbery Award. The author says that it was unlikely to be selected because the award is generally bestowed upon works of more serious intent, and not one intended to be a fun read. And a fun read it is! Although consistent with the current trend in paranormal subject matter in juvenile books, this work would be enjoyed by readers who don't normally read horror or ghost stories. Even though the paranormal aspect is an intrinsic component of the story, it is not the key message of the book. I found this book to keep my interest through all the adventures and experiences of Bod Owens. The pace would not allow me to set the book down. The tempo of the story combined with the excellent storyline will certainly appeal to young readers. It is the perfect vehicle for escapism. It is one that easily takes the reader away from reality and returns the reader again, in a quite fun and touching manner. and lively! This was a fun, engaging, and thought provoking (in my own way) escape from my mature daily government job. Romulus and Remus were raised by wolves, but what happens when a gifted and special young man is raised by the dead? Youth is challenging, but when you literally have the wisdom of the ages at your disposal, and are given the run of your graveyard home, then something very special is bound to happen.